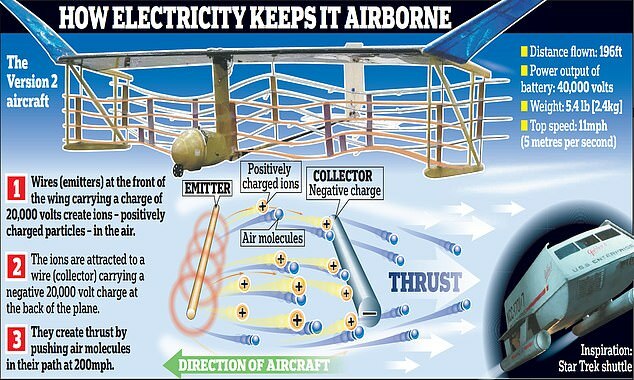 Researchers from MIT have flown a plane powered by an ‘ion drive’ for the first time. The drive uses high powered electrodes to ionise and accelerate air particles, creating an ‘ionic wind’. This wind drove a 5m wide craft across a sports hall. Unlike the ion drives which have powered space craft for decades, this new drive uses air as its accelerant. The researchers say it could power silent drones. This entry was posted in News and tagged drive, first, FLIGHT, ion, Ions, MIT, plane, revolutionary, SMART. Bookmark the permalink.